Redwood Shores is an affluent waterfront community with a population of approximately 10,500 people. Founded in the 1960’s, the new community of Redwood Shores was formed and annexed by Redwood City. In 1968 the final map was approved for the first housing units. In 1975 a master plan was developed blending housing and commercial projects including a 200 acre lagoon system. Located east of San Carlos on the mid-Peninsula residents and employees enjoy nature strolls along beautiful lagoons, landscaped walkways and bay-front open space. Pacific harbor seals have occasionally been spotted in the waterways/lagoons around Redwood Shores. The areas in and around the community are home to a variety of wildlife including raccoons, skunks, ducks, geese, egrets, great blue herons, clapper rails, harvest field mice, sting rays, and many other species. Canadian geese pose a nuisance and the community is actively working on reducing their presence. 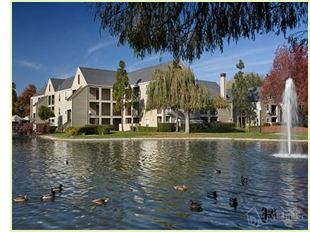 Redwood Shores is populated with million-dollar homes and town-homes, condominiums, and apartment complexes. Many of the houses and condominiums surround waterways/lagoons and have access to inner waterways through private boating docks. According to Forbes magazine, Redwood Shores is placed on top of “America’s Top Selling Luxury Neighborhoods in 2009”. Redwood Shores is the setting for college rowing races, including competitions among Pacific-12 Conference universities. It is also the home of Bay Club Redwood Shores (more commonly known as the Pacific Athletic Club or PAC), a private sports club with 2 indoor/7 outdoor tennis courts, squash, pools, yoga, gym, water-park and clubhouse facilities). Major technology companies maintain headquarters in Redwood Shores, among them Oracle Corporation and Electronic Arts. The community also includes a branch of Ernst & Young, a hotel (Sofitel Bay Area), Sandpiper Elementary School and Redwood Shores Elementary School, and a branch of the Redwood City Library. To the south Redwood Shores is bordered by the San Carlos Airport.